The ‘Brace’ Elm, South Side of The West Lawn. Royal Pavilion. As a young Arborist around 1968 I was more than a little disturbed to be told to meet the then Director of Parks, Mr Ray Evison at the Royal Pavilion. In those days it was pretty unusual for general staff to have any direct dealings with the most Senior Officers unless you had really blotted your copybook, so I turned up with a high level of trepidation. I met up with Mr Evison at the base of the large Elm tree situated on the southern boundary of the gardens which still exists today. This English Elm was considered of high historical importance as it was reputed to have been among the first amenity plantings to be made in public Parks in Brighton and is thought to have been planted in 1776. There was also a strong probability that the tree had featured as part of the original Promenade Grove now lost to the current Nash landscaping scheme. The Elm in 1968 was of course already overmature, some 20m in height with a girth of some 4.6m and had two major features that made this stand out from the other Elms in the garden. The first was the poor condition of the main stem which had two extreme areas of decay that had deteriorated to allow large cavities to exist and the second was the presence of two large forged metal bands that had been placed completely around the trunk, most likely to reinforce the trunk and prevent the weakened structure from collapsing. At the time Arboriculture was beginning to emerge as a discipline in its own right out from the mantle of general horticulture and dealing with fungal and physical damage induced cavities was now being considered in greater scientific terms than filling a cavity with concrete and masking what was occurring deep within the damaged area. This, Mr Evison explained was what we were now attempting to achieve with this tree, by applying some science and arresting the speed and level of decay might prolong the life of the tree allowing it to remain in a public place with as little risk to the public as could be managed. My task proved unusual at the time but was relatively simple in execution. Firstly, the tree’s canopy was carefully reduced to relieve the weight on the weakened main trunk. Then armed with a range of wood chisels and mallets I began to remove the decayed wood from the interior of tree. This at first was simple as the wood had deteriorated to the consistency of wet cardboard and removal went quickly. However, it became obvious that it would be necessary to gain further access to the interior of the trunk to allow the task to be carried out fully and effectively and during discussion on the Director’s next site visit we decided to open the north facing cavity with a chainsaw, just enough to allow me to crawl inside. This action while invasive did ultimately allow the decayed timber to be removed back to ‘healthy’ timber and with the introduction of sunlight and airflow into the void the deterioration was arrested. 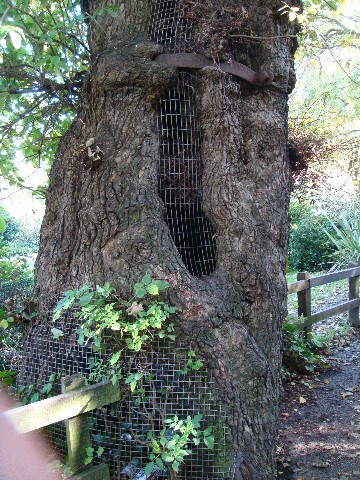 The tree now had a large single cavity resembling a ‘sentry box’ and other concerns now had to be considered. 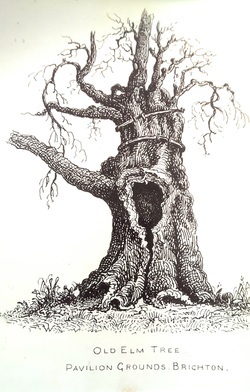 The tree was now able to be accessed from the public lawns and sadly it was known that such ‘hollows’ were often abused with rubbish being dumped within rather than being walked to a litter bin. Of greater concern was the fact that when such rubbish was allowed to accumulate, fires were often started by possibly by discarded cigarette ends or possible just as an act of vandalism. To reduce this risk the cavities were filled in with weld mesh, cut and shaped to keep the trunk dimensions while still allowing light and air to penetrate. Interestingly, some time after the completion works an elderly lady contacted me and declared her delight that the tree was being cared for. It transpired that it was her father, a blacksmith who had fabricated the bands and had also been employed to fit these to the tree’s trunk and she had held the bag of nails and nuts and bolts and had passed these up to her father. She also said that she still had an etching of the tree made at the time and would be pleased to loan it to the Department so that a copies could be made. She was as good as her word and photographs were subsequently made and framed, with my copy accompanying me through many and various departmental changes over 40+ years and is still in my possession. 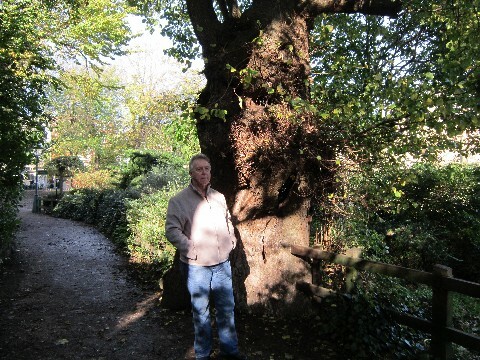 Due to Ray Evison’s early foresight , a young Arborists enthusiasm and constant phased maintenance by the Parks and Gardens Department when the gardens were under their control, the tree survives today. Sadly, the phased maintenance carried out over many years has not been seen as important by the current department responsible for its care. 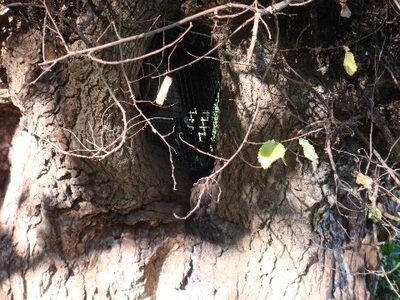 Sadly, when viewed recently the hollow trunk was seen to be compromised by the invasion of litter and poor maintenance of the mesh allowing this to occur. a sad indictment of the present management.